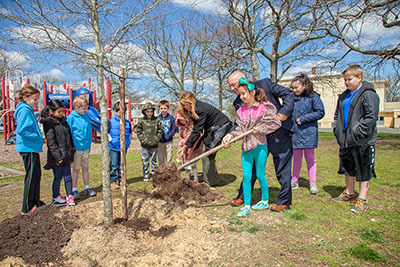 Monmouth County encourages schools to participate in its Arbor Day program. If your school has an Arbor Day program that actively involves the students, your school may apply. Arbor Day is the last Friday in April, but due to the 2019 school calendars, it will be celebrated on Friday, April 12 this year. In the past, students in several classes or grades have used a combination of storytelling, artwork and music to explain what trees mean to them or why trees are so important to our ecosystem. Every school is different and has special presentations. The County Shade Tree Commission will work with each selected school to find the appropriate location and tree for planting at the school. Prior to Arbor Day, the County will dig the hole and pre-plant the tree. On April 12, students will present their Arbor Day program and then finish the tree planting by shoveling soil on the tree’s root ball. The program will conclude with each student receiving a tree seedling to take home. The Board of Chosen Freeholders provide a personalized Arbor Day proclamation as well as speak to the students. If your school is interested in participating, please complete the form. You may submit the form by mail to Director Thomas A. Arnone, Hall of Records, One East Main Street, Freehold, NJ 07728, or submit the form to lauren.bumbera@co.monmouth.nj.us. If you have additional questions, call 732-431-7396.